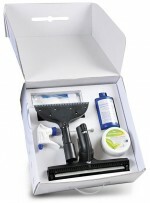 Practical special extensions and powerful universal cleaners are included in this kit. The kit includes: a squeegee, a window cleaner, a stain remover and a belvando bio-multipurpose cleaner. This kit is the perfect helper for all cleaning requirements. The kit includes: a natural hair broom, a hand turbo nozzle, a natural hair dusting brush , a drain adaptor, a multifunctional extension, various scented oils, the microfibre cloth all-rounder from belvando, a floor fibre Extra cleaning pad and an accessory holder. This exclusive accessory kit offers the perfect basis for household cleaning. The especially for water vacuum cleaner vivenso developed spray extraction kit enables you a simple wet cleaning of the dusty and dirty carpets, upholstery, car seats and mattresses. The vivenso power nozzle is especially suitable for the maintenance of carpets as well as upholstery and mattresses.